Q: So, let’s start with the basics: the rock, types of climbing and best time of the year to climb. A: Probably the first thing to say about rock climbing in the Sinai is that it’s dry conditions all winter long, October to April. This makes it perfect for European climbers who want to extend their summer season, or just get some winter sun! 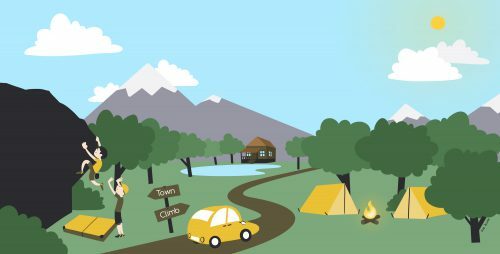 Daytime temperatures are perfect for climbing, and for the most part nights are fine for overnight camping. In Dahab, we rarely drop below 10c, so it’s easy to camp year round. If you’re planning to trad climb in St Catherine between December and February, stick to daytrips from the camps or be prepared for very cold nights camping in the mountains (you probably won’t hit -5c and a blizzard, but you could). For bouldering in Dahab, November to March is best as even the most exposed boulders get more shade and stay cooler. A: The Sinai desert has granite, sandstone and limestone but all of our climbing is on granite – the central range and the granite wadis (valleys) that descend from the high mountains to the Red Sea coast. We should also say that the wadis flash flood in the rare instance of rain (once or twice a year), so if it clouds over and your drivers tell you it’s time to go, it really is time to go! Q: What about the type of climbing? St Catherine is Protected Area so trad climbing only and, please, no climbing at all on Mt Sinai (Jebel Mousa) or Jebel Katrin – stick to the pilgrim paths. 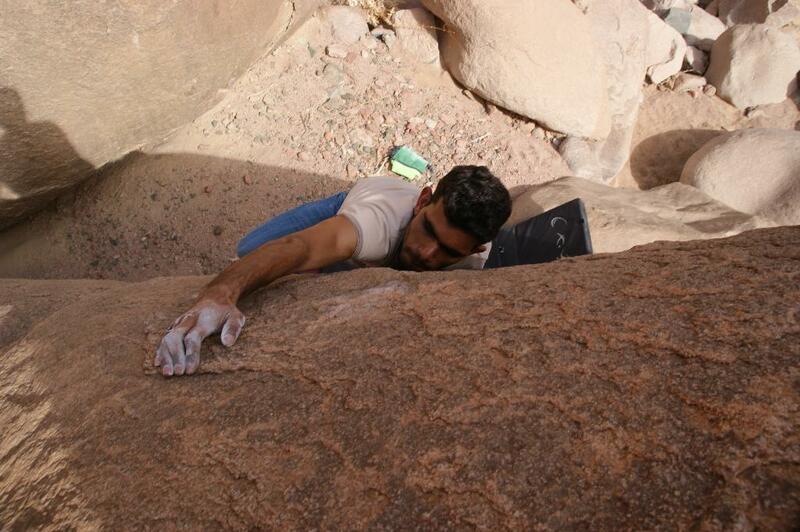 In Dahab, we have sport climbing and bouldering. Wadi Qnai in Dahab is the most developed for sport climbing – single and some multi-pitch from French 3c to 7b. What blows away most climbers in Dahab is the bouldering – absolutely everything and almost endless. There is even a dedicated Dahab bouldering guide now. Wadi Kid and Wadi Nassup are in their infancy – we’re only just starting to develop them but they have as much to offer as Wadi Qnai. Both wadis offer more mutli-pitch than Wadi Qnai, which is important as our local Egyptian climbing scene develops and people want to extend their limits. Trad climbing is mainly crack climbing, sport climbing is slightly steep to slabby and the bouldering extends into vertical, roofs and overhangs. A: Well, if you read what other people say about climbing in Dahab and the Sinai, you’ll notice that they talk about the Bedouin people. The experience here is guided, partly because it’s required for people to have a guide with them when they go to the desert; partly because it’s a nice way to get to know the people here and see how we live. And I must say that for us, it is nice to share our desert with people who appreciate it as much as we do. A: We love them all! If we had to pick a favourite though, it would probably be Waterfalls, just because it is so versatile. A box canyon, and a waterfall after a good rain, the routes range from 3c on the left to 6c+/7 multi-pitch on the right. The camping area is also at the entrance to Waterfalls, so it’s perfect for camping overnight and early morning climbs. This is where Dahab really has something over other climbing destinations. In addition to climbing and trekking, you can kite and windsurf, scuba dive in the Red Sea and freedive Dahab’s famous Blue Hole. We even have great drop in yoga classes, so it’s easy to get a good stretch before and after your climb!